Set in the heart of the Las Vegas Strip, the Tropicana hotel offers a resort-like, Miami-Beach feel, highlighted by ample entertainment that includes an on-site casino and two-acre pool voted the “best in Las Vegas.” Glow, a Mandara Spa, occupies 10,000 square feet on the mezzanine level and complements the Mandara brand’s cosmopolitan style with the hotel’s South Beach-inspired scene. Treatment rooms are equipped with Chakra light therapy, and designated couple’s areas comprise a wet villa and wet suite with oversized baths and showers. The Technogym-equipped fitness center features high-tech touches like touchscreen monitors and iPod capabilities. The tropical vibe ensues in standard guest rooms to the penthouse lofts, and both fine and casual dining venues are on hand to tantalize appetites. The hotel’s 60,000-square-foot Tropicana Las Vegas Conference Center can accommodate up to 2,000, and the award-winning Island Chapel hosts weddings. Located on Tropicana’s mezzanine level, Glow, a Mandara Spa, is chicly designed with sandy hues, textured fabrics and wood and stone elements evocative of a beach hotel. Both design aesthetic and vibe are an expression of sophisticated calm, reflecting Glow’s “total relaxation time” philosophy. 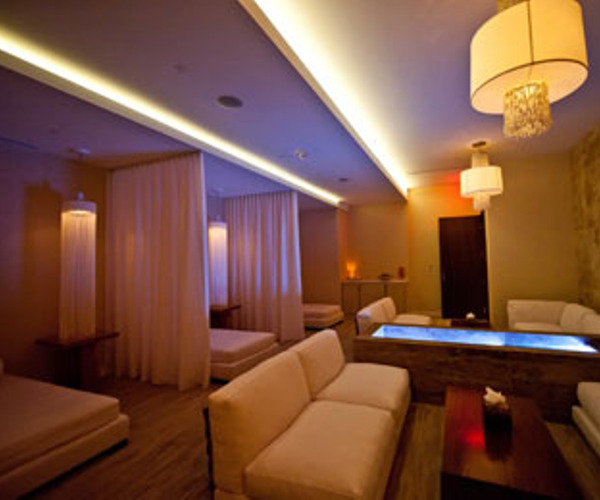 The spa menu provides spa-goers a comprehensive fusion of exclusive Glow, Mandara, Elemis and Bliss treatments, all of which meld natural active ingredients with modern technology. Popular services, taken from Glow’s “Top 10” menu, include the GLO 2 Facial®, bamboo massage, Thai poultice massage and the Sweet and Spicy Orange Body Scrub. The 10,000-square-foot spa features nine treatment rooms, including couple’s wet villa and suite rooms with a dual tub and shower, along with a full-service salon. Thoughtful details like fruit-infused water and herbal tea in his-and-hers relaxation lounges, and locker rooms equipped with steam areas, showers and, in the men’s locker lounge, a TV, add to the spa experience. Tropicana’s two-acre pool scene, voted the “best in Las Vegas,” heats up the city by offering visitors a taste of South Beach. The tropical-style aquatic playground tempts guests with lush foliage, cascading waterfalls and private daybeds and cabanas, the latter of which sport couches and tables, bottled water, energy drinks and more. White marble walkways lead guests to the Tropicana hotel casino, where a variety of slot machines, table games, roulette and a race and sports book area entice gaming excitement for novice players and high-stakes champions alike. Entertainment options include the Bagatelle Beach & Nightclub, the Ambhar Lounge and Laugh Factory comedy club. Hiking opportunities and sightseeing tours of the Hoover Dam, Lake Mead and Red Rock via helicopter, bus and Jeep are available right outside of Las Vegas. More than 1,300 guest rooms are available in a variety of room layouts. Options include standard deluxe rooms, beach club rooms, two-story penthouse lofts and presidential suites. Accommodations are bedecked in South Beach-style decor, accompanied by white plantation shutters, warm color palettes, custom furnishings and original artwork. Amenities include Euro-Top Serta mattresses, 42-inch plasma HDTVs, iHome docking stations and wireless Internet. Tropicana’s four on-site restaurants suit any epicurean’s taste. Options range from the island-style Biscayne Steak, Sea & Wine steakhouse to the Bacio by Carla Pellegrino Italian eatery. The Beach Café, open all day, serves contemporary American specialties, while the casual South Beach Marketplace is a good choice for quick bites.